When importing my tens of thousands of photos into Adobe Lightroom 5 for Mac, I wanted to take advantage of import presets to automatically re-organize my photos chronologically to replace the somewhat haphazard folder structure I had been using for many years. I wanted the top level folders to be 4 digit year (YYYY), and inside each year I wanted one folder per month, with the year and month in the folder name, but not the date (YYYY-MM) since I don’t need 365 folders per year. 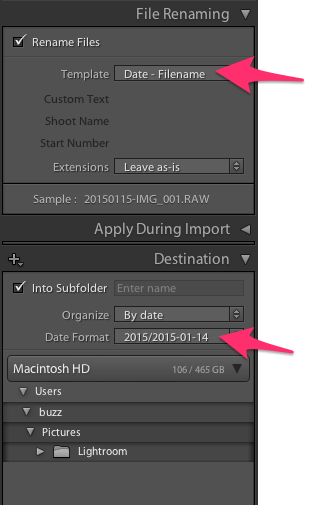 Desired Destination folder: YYYY/YYYY-MM Lightroom’s default import presets for the Destination do not have an option to have just the year and month as a folder name (without the date). It does offer a Destination YYYY/YYYY-MM-DD which is close, but too granular since I don’t need a separate folder for each day. So I want to remove the -DD day portion. Desired File Renaming: YYYYMMDD-originalname In addition to storing the files in chronological YY-MM folders upon import, also wanted to Rename the file on import to prefix the filename with the date, for example 20141201-DSCF1000.JPG, which fortunately IS one of the defaults for File Renaming. I found several forum posts with users wanting to do the same thing, and some very out-of-date posts about editing a file called TranslatedStrings.txt which no longer exists in Lightroom. The solution in Lightroom 5 turned out to be simple. What I did was select the”File Renaming” and “Destination” defaults closest to what I wanted, saved it as a user preset, then used a text editor to edit the preset file. Step 1 – Save an almost-right User Preset After clicking Import, on the right pane I selected the two options show below: under Rename Files I chose Date – Filename and under Destination I chose into Subfolder by date with format YYYY/YYYY-MM-DD which gave me something to edit (all I need to do is remove the “-DD” part, as described below. Simply save the text file. Close Lightroom, then relaunch it. Click the Import button and in the bottom Import preset pane choose your new preset MyYYYY_YYYY-MM option. When you import files into your catalog it will copy them to the new folder structure.